Here the Guardian reproduce some 80 emails between Government officials and the British nuclear industry. These show that within 2 days of start of the Japanese disaster the government and industry had their heads together rehearsing their lines. The disaster started on March the 11th and by March the 13th, a Sunday, the British Government had prepared a,'Let's not rush to judgement' announcement. Well they certainly had. 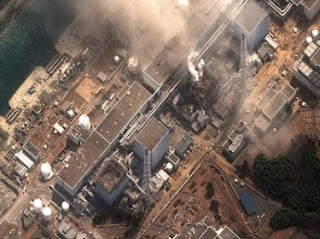 On the day the press release came out the Fukushima reactor building 3 exploded. This was when Energy Secretary Chris Huhne mocked continental politicians, those excitable Germans, for their response to the crises. The stoic British kept to a press strategy that had been worked out the previous weekend. This warned that anti-nuclear types would probably compare the disaster to Chernobel. By the 12th April Japan itself had classified the Fukushima incident as being equivalent to Chernobel. The recent revelations regarding News International, the Murdoch news empire, reveal a level of complicity between the press and government. As regards nuclear power the British Government had decided on its energy policy and it doesn't want to have to go changing it just because of public opinion. Murdoch promised his support to the British government, in return for support of his project to dominate British media. And, perhaps by coincidence, the government had no trouble getting its take on Fukushima into the papers. Nuclear power is hideously expensive if the costs of incidents like Fukushima are properly considered. No insurance company will supply cover for a nuclear power station. It is assumed that the government will carry that burden should it be needed. If nuclear power companies had to buy insurance cover on the free market running costs would be much higher. Governments, of course, don't like to remind taxpayers of this important fact, and the nuclear companies certainly don't brag about it. The UK government, in particular, seems to be being led around by the nose by the nuclear industry. 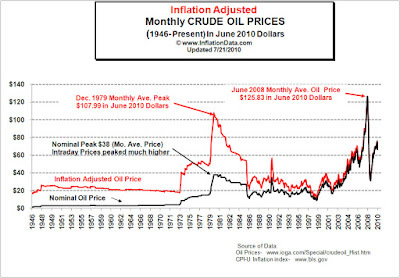 Peak Oil is another issue the British government just doesn't want to think about. The issue driving price is supply and demand. Even the effect of Peak Oil could be cushioned if nations prepare for it and start developing alternatives. 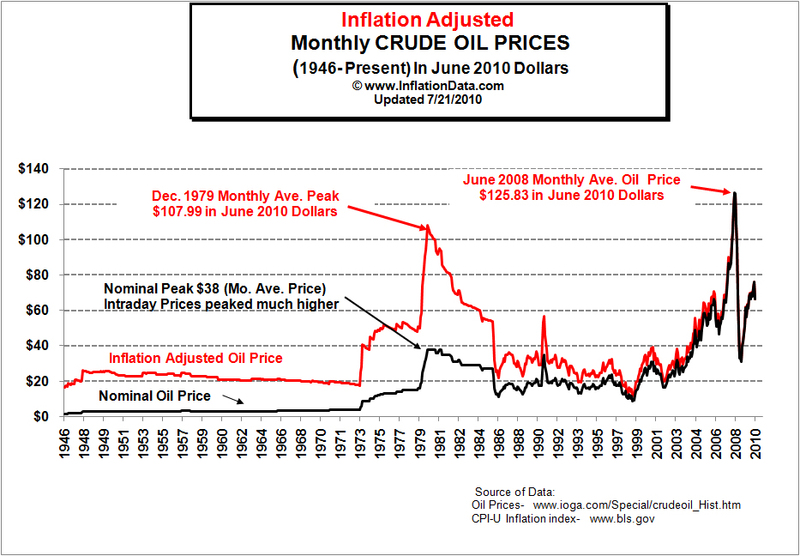 If demand reduces before supply starts to decline oil prices don't have to shoot through the roof. This is the lesson of the two big oil crises of the 20th century. These were generated by suppliers intentionally restricting supply and this led to some startling price spikes. When demand outstrips supply prices soar and for no additional effort profits increase, and users must belatedly struggle to find alternatives. Thus, it serves the purpose of the oil business to encourage complacency and downplay the prospect of Peak Oil. But, while Britain chortles as Jeremy Clarkson and the Daily Mail mock developments in renewable energy Germany is forging ahead. The Fukushima incident served as a catalyst to Germany to declare that it would start to close down all its nuclear power stations. German hopes to produce 35% of all its electricity from renewables by 2020 and 80% by 2050, with a reduction of electricity usage of 50% by 2050. Currently the anti-renewable lobby claims that all renewable proposals are lacking when it comes to dealing with the fluctuations of supply, windless day = stationary windmill, thus renewables are in trouble. And that when renewables fail to meet demand additional costs are incurred by starting up hydrocarbon powered peak-load turbines. Even with non-renewable power, with much of the load carried by nuclear or coal/oil powered generators, peak load turbines are required. Power consumption goes through all kinds of peaks and troughs during a 24 hour cycle and when demand is very low, at night time, a conventional generator plant often has to waste power venting steam because demand is so low. A fully developed renewable system can deal with both demand and supply fluctuations. 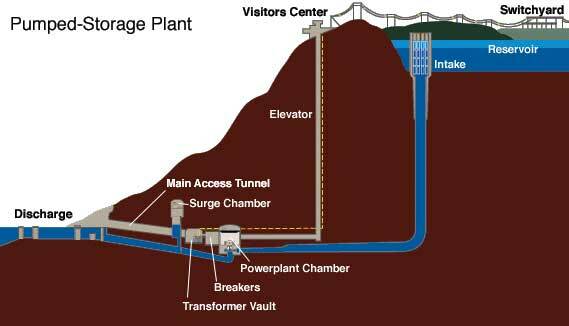 A very mature, low risk, system is possible that stores power by pumping water into elevated resevoirs. By pumping water to a higher level at times when demand is low or supply high, and allowing it to flow down and drive a generator when demand is high or supply low, the peaks and troughs of demand and supply can be managed. However, one of the main issues is finding suitable areas for the two essential bodies of water. 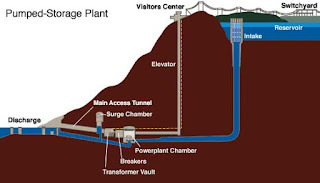 Now Germany has come up with an innovative concept, the possibility of flooding used up coal mines therefore concealing the reservoirs underground, and finding a use for those exhausted, non-renewable energy sources the coal mines. Already some 20% of Germany's electrical power comes from renewable sources: Windpower, Biomass, Hydropower and Photovoltaic Solar power. In the UK it's about 6%. No prizes then for guessing which nation will develop the essential renewable power technologies of the future.